Go Seamus, it’s yo birthday, we’re gonna party like it’s yo birthday. WE’RE ALL FAMILIAR with Seamus Heaney. Whether you studied his work in school, are an avid fan, or indeed are just aware that he is a great talent, his significance in Irish culture is undeniable. As today is his birthday, we felt it was the perfect time for a little pop quiz, to see how much you really know. So, pens at the ready? Let’s begin. 1. Which of these universities has Seamus Heaney not been a lecturer at? a) Two-thirds of the sales of living poets in the UK. b) One-third of the sales of living poets in the UK. c) One-quarter of the sales of living poets in the UK. 4. Who did Seamus Heaney say this about? 5. Which of these honours has he turned down? 6. Which of these is not an anthology of Heaney poetry? 7. Which American President visited Seamus Heaney during a spell in hospital? 8. 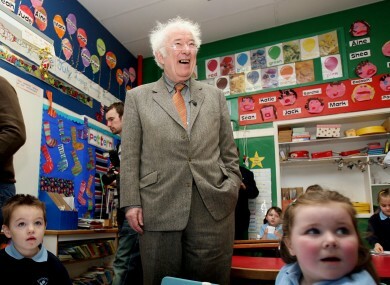 Which of these children is Seamus Heaney? Email “QUIZ: How well do you know Seamus Heaney?”. Feedback on “QUIZ: How well do you know Seamus Heaney?”.